After working more than 15 years in position of architect, interior designer, graphic designer, brand developer, exhibition design and advertising fields, “ Toh – Suparat Chinathaworn ” began to look for the new passion and challenge for his own design industry. 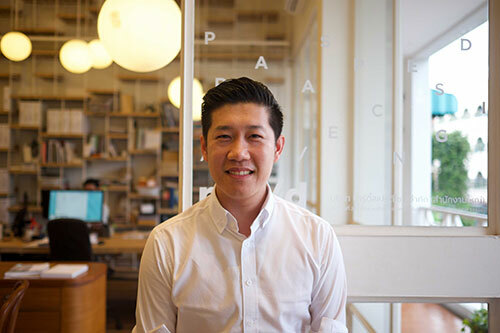 At the same time Him–Kijtanes Kajornrattanadech a passionate product designer from Rangsit University came back from spending a year in london for Master degree in industrial design at central st. martins. They met at designLab in 2007, then reunited to collaborate on several design projects in 2011. The result of their collaboration and their own collective knowledge from professional experiences in creative and design industry, the two formed up “party / space / design” in 2012. “ party/space/design ” or “ p/s/d ” is a cross disciplinary design consultancy based in bangkok, gathering a small group of cross functional designers to seek for the new different aspect in design solutions. p / s / d services range from interior | exhibition | product | graphic | branding to corporate identity, specializing in restaurant and retails interior – experiential design. Believing that “a good design is a design that not only achieves a desired effect but also shapes the expectation of what the experience can be”, each of designer work deeply to understand the brand, space and users’ insight while integrate their expertise together to solve the limitation of scale, object and usage. this way of working allows the design by p / s / d to be sk0-004 study guide distinctive with details that full of creativity and functionality. p / s / d works to ensure that the design is answering clients’ needs, creating positive effect to the business and society while excite end-users experiences.